This is the Powell & leadland 'High Power Achromatic Condenser'. It was first introduced in 1857 by Powell & Lealand and this, the improved version, about 1878. 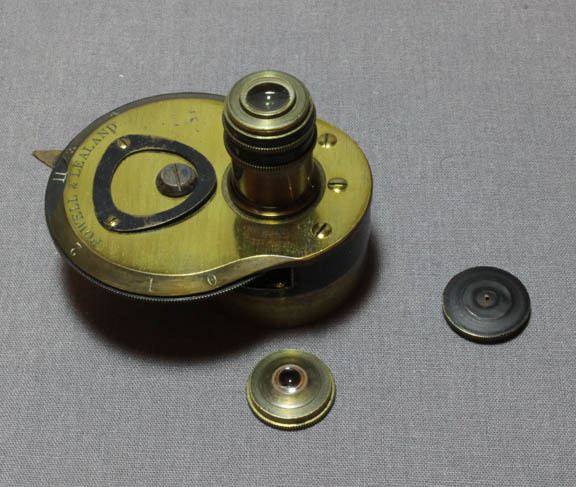 It has a cap with a pinhole for centering. With a focal length of about 1/5 inch, it is suitable for use with any high power (dry) objective from 1/4 inch focal length* to as powerful as a 1/8 inch focal length*, and even more powerful ('dry') objectives. When all optics are present, the condenser has an aperture of 170o and an N.A. of 0.99. -Focal length 1/5 inch, total N.A. 0.99, aplanatic N.A. 0.8. -With top lens removed, focal length 1/3 inch, aplanatic N.A. 0.5. -With bottom lens only, focal length 2/3 inch, aplanatic N.A. 0.24. 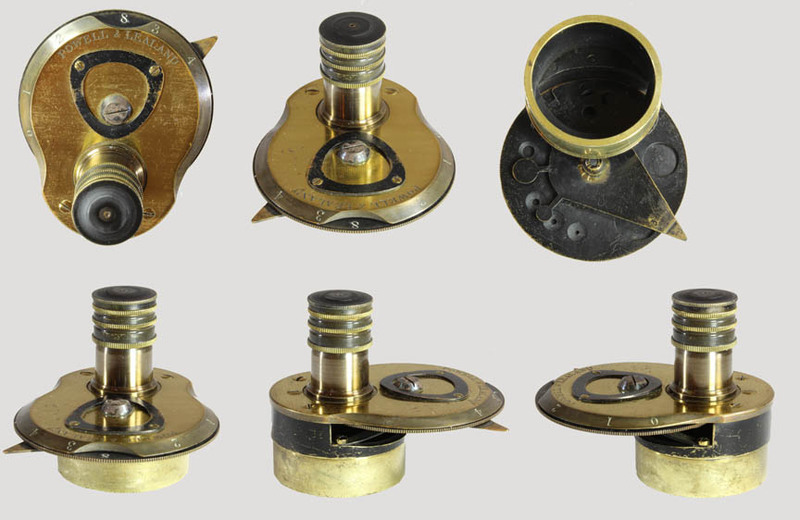 It has both a wheel of apertures and also a choice of stops with the stops and the apertures controlled separately. The apertures are controlled by a knurled knob revealing white numbers in the semicircular opening. The pointer controls the stops. This pointer, (which originally would have bent around the edge of condener)points at numbers for the different stops seen on the beveled brass edge of the condenser. The blackened rounded-triangle piece on top of the condenser serves as a spring holding down a bearing to register the apertures so they are properly centered and stable when turned into place. With the top element removed, it can also be used with moderate powers to focal lengths as long as 1 inch. In 1891 Nelson stated in the JRMS that this was the best condenser ever produced. * A 1/4 inch focal length objective has a power of about 25X, or total magnification of about 250X when used with a 10X eyepiece. A 1/8 inch focal length objective has a power of about 65X or about 650X total magnification when used with a 10X eyepiece.